The kids can’t play outside unsupervised; the puppy’s off down the street again. It’s time for a fence. You want to complement the beauty of your yard, and you want to build it yourself. Traditional design and easy maintenance make a classic picket fence the right choice. Have a survey done to determine the actual boundary of your property. Contact the local code enforcement office; they will provide you with the proper setback information. Call your water, gas, electric and phone companies. They will come out and mark the locations of their lines on your property. 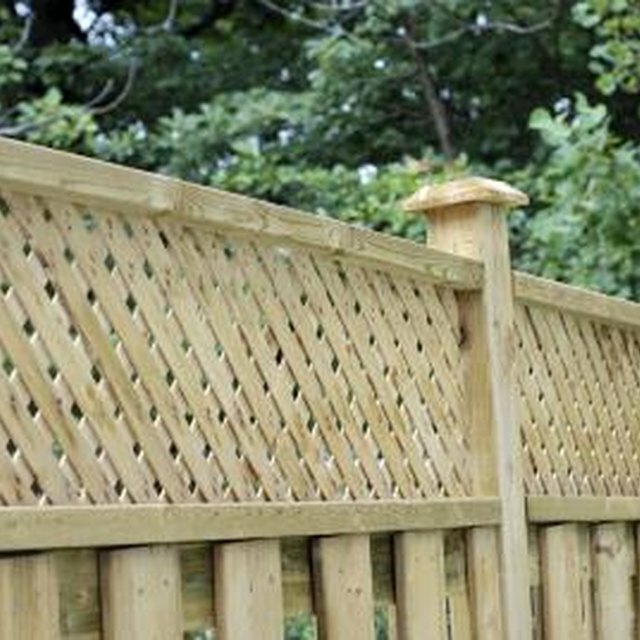 Make a detailed design of your fence. This will allow you to determine the total linear feet of the fence and the quantity of materials required. Place stakes in the corners of the yard you’re going to fence. Tie mason’s string tightly around the first stake, pull it taut and secure it to the next stake. Continue this process until the fence outline is complete. You now have a straight-line guide for setting your posts. Dig all your holes using your shovel or posthole digger. Your holes should be about 20 inches deep. Using your framing square for accuracy, screw a straight board 90 degrees from the edge. Place your post in the center of your posthole; make sure the post is level and perpendicular. Fill the hole with cement and allow to cure for 2 days before hanging the panels. Cut 1 by 4 treated pine boards to 42 inches in length. Draw your design on the wood. Make it 1/8 inch larger to allow for the router collar. Cut with a coping or jigsaw. You now have a template from which to cut the rest of your pickets. Clamp a flat surface to one side of your worktable and screw down a board at 90 degrees. This will ensure that the pickets are straight. Place your first picket 2 1/2 inches from the rail; then lay out the rest to ensure you’re pleased with the look. Use a spacer board for accurate placement. Secure the pickets to the rail with 2-inch galvanized deck screws. Make sure your screws are flush with the wood. Make a temporary brace for your finished panels by nailing a scrap piece of wood diagonally across the panel. Mount L-brackets for the top rails onto the posts. Mount L-brackets for the bottom rails onto the rails themselves. Screw bottom rails into the post after the panel is in place. Attach the top rail to the post; make sure your panel is level before attaching the bottom rail. Build the gate like the other panels; add a permanent cross brace for extra strength. Brace the doors of the gate together with a small piece of wood to hold them in place while you install the hinges. Install the gate the same way as the other panels. Use spring-loaded, self-closing hinges in place of the L-brackets. Fix the latch. Use a clear waterproof sealant to protect your new fence from the weather. Set posts less than 8 feet apart; posts set more than 10 feet apart will contribute to sagging problems. Always wear safety glasses and gloves to protect yourself from injury.